The Communications Centre is a vital and critical link between the citizens served and the public safety agencies, EMS and Fire, dispatched. Our mission is to answer all requests for medical and fire responses; consistently deliver life saving medical instructions as provided through existing protocols and dispatch resources efficiently within the standards established by the Ministry of Health and Long Term Care and our stakeholders. Kenora CACC will strive to ensure the preservation of life and property through professionalism and compassion. The Kenora Central Ambulance Communications Centre is located in Ontario's Sunset Country, Northwestern Ontario. 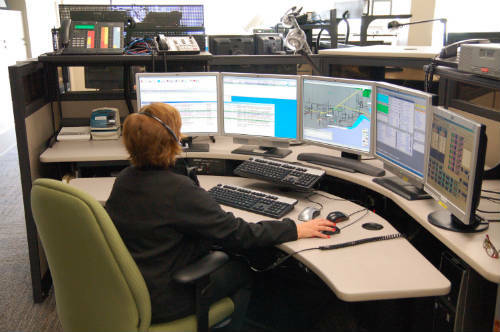 Our centre is part of the provincial Ambulance Communications (CACC) system which is funded or directly operated by the Ontario Ministry of Health and Long Term Care, Emergency Health Services Branch. Our staff are employed by the Lake of the Woods District Hospital. We provide calltaking and dispatching services for all Land Ambulances and Medical First Response teams in our catchment area. We also provide calltaking and dispatching services for thirty-nine Fire Departments throughout our region, as well as, Lake of the Woods Search and Rescue. To the west, the Manitoba border; to the south, the U.S. Border; to the east on Highway 17, the community of English River and on Highway 11 , Highway 802 and; to the north, Hudson Bay and James Bay. We cover over 470,000 square kilometers!